This video and summary came from Lene Særmark, a young trainer in Denmark, who has generously shared her clip and experience with us. 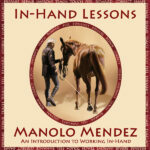 These clips are being shared so that you can see how Manolo teaches and uses different figures to make learning easier for the horse to learn to counter canter in balance. Before you ask for counter canter your horse must have basics in place. We have written articles about training progression here. “Even though Blue prefers canter to trot, the quality of his canter has needed a lot of attention and improvement, which I worked on with Chantelle Matthews last year. We worked on always keeping the intervals in canter short so he would not get tired and lose the quality of his canter, we worked on helping Blue find a good posture with a forward, down and out neck, supple poll and open throat latch/nose in front of the vertical in the transition to canter, in canter and back to trot. To achieve this posture, the rider’s hands must follow the movement of the horse’s neck and head down and forward, in the same rhythm as the horse. If not, the hands will block the horse’s movement in canter which will make the horse’s neck short, pull the nose behind the vertical, and make the head go up and down like a hammer. So I strive to keep my shoulders, elbows and wrist relaxed and soft so my hands can follow the horse’s mouth without my upper body moving back and forth as well. This posture helped him move with more freedom and regularity. We worked on relaxation so that he could lengthen and gather elastically and develop a good balance and rhythm on easy lines. Blue’s canter has improved a lot as he has become fitter and more balanced, and this last visit, he was ready for Manolo to work with me on preparing him for counter canter using simple exercises that made it easy for him to learn to move with a rider in this new balance. We used the shallow loop, first in trot, then in canter, to teach Blue to bend and change the bend in his body properly. Too often when riders ride counter canter they bend their horses to the outside, making it difficult for the horses to keep a good balance and rhythm as it causes the hindquarters to leave the track. First we rode shallow loops,only 3 or 4 meters from the track at its apex, which is easier for the horse, and then progressed to riding a 10 m shallow loop. We also used the tear drop, a 12 or 15 meter half circle from the short side, back to the track changing the rein and the diagonal, all of which Blue was already familiar with from the trot. As a final preparation, we did as small a circle as was possible for Blue to do comfortably in canter, which was about 10 meters, to make the half circle in the tear drop as small as we could, to get a more flat angle when we connected back to the track in counter canter, making it as easy as possible. Once Blue had tried the different exercises and lines individually, we connected the dots. In a good canter, we rode 12-15 meter half circle back to the track, keeping the canter to the right on the left rein, we followed the track for about a 20 meter half circle, making sure not to go too deep in the corners and thereby making it difficult, and then we changed back to the right rein again through the diagonal. Blue did it very nicely without struggle each time throughout the weekend. I do love how everything is taught through true progression, always making it easy for the horse to understand where and how we are going. They never have to guess, but are always guided gently through the lesson. This prevents them from getting tense which makes them stiff or discourages them from the work. Blue is a very sweet horse, but when something bugs him mentally or physically, he tends to get downright angry. This makes him more tense and often causes him to bolt.